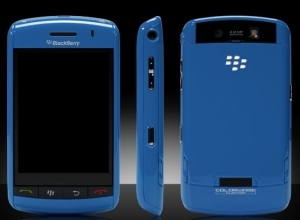 BlackBerry Storm customization by Colorware | BlackBerry Blast! If you're bored with the stock color of your BlackBerry Storm, or you simply want to stand out in a crowd, you can get your Storm customized by Colorware. They will take your Storm apart, carefully paint it, and assemble it again for you. You'll have the option of solid or metallic colors as well as combining colors to fit your personality. You can have a different color for the side, bottom, top, etc. You can either send in your BlackBerry Storm to Colorware, or have them send you one from their stock. If you purchase one new from Colorware expect to pay a high price ($919). If you send them your own BlackBerry Storm, prices start at $129.